The Good Soldier – Notes 16 – IT’S A WRAP! Yesterday (Monday, 8/17/09) was a milestone for both the film and myself. We completed the film production phase on The Good Soldier. The film is already on its way to California for processing and transfer. And I am on my way tomorrow as well – to San Diego for a vacation. I will spend Friday in Burbank at Yale Film & Video supervising the transfer of the film to digital. By the days end I should have the entire digitized film on hard drive and the actual film on reels. The shoot yesterday went really well. We had two scenes at two different locations. We started at the gym for the first scene. There was almost a continuity issue but luckily Erik caught the fact that some characters were wearing gloves in previous scenes and we’d forgotten them in the scene we were shooting. Thankfully he caught it in time for us to quickly re-shoot the scene, this time with gloves on. Then we rushed down to Norman for the second scene. The “bedroom scene,” as we are calling it, went really well. Thanks to “Dr. Joe” for letting us use his house – it was the perfect location – I couldn’t have asked for better. It was a fun scene to shoot – maybe a little awkward for the two characters but they both did an awesome job and we all had fun making jokes about the whole situation. We even had time to play a little Rock Band. Oh yeah, one more thing – we finally had a light burn out. 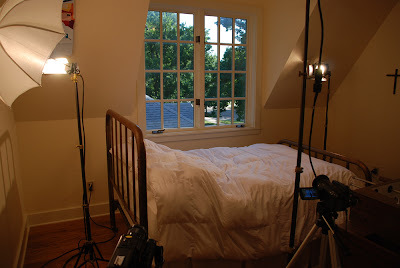 Just before shooting the bedroom scene one of the lights fizzled. I guess we lucked out that it happened on the LAST shot. That’s one piece of advice I never took: always have extra bulbs. Next time I will. There are some more pictures from the film uploaded to the Picasa site – scroll down for the latest ones.